Gionee launched another smart phone device called Gionee F103B. The device has 4G LTE with a battery capacity of 2400mAh. its unlike Gionee to produce this kind of battery, although the reason is best known to them. 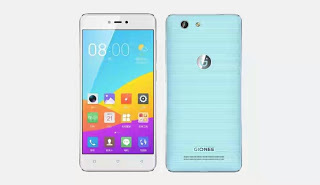 Gionee I know produces high capacity battery when it comes to manufacturing phone's battery. May be they are up to something that will benefits all, let's be calm and watch. Below are the features of Gionee F103B. Availability: May 2016; in China for the main time.